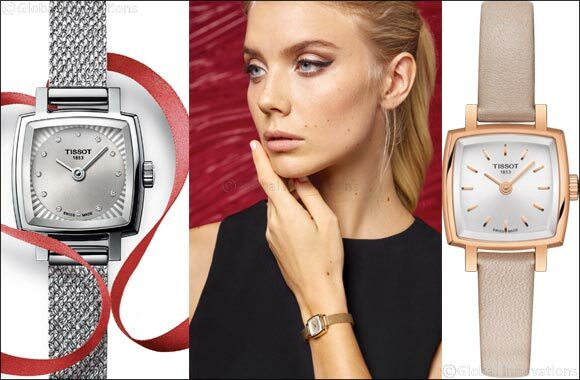 Dubai, UAE, January 24, 2019: A tribute to the small Tissot ladies' watches of the 1960s, the Tissot Lovely Square is an utterly feminine creation, calibrated for the finest wrists. With delicate 2 x 2 cm dimensions, it is nonetheless bold in its square design, and its satin-smooth case glimmers whatever the season. Its exquisite dial, displaying minutes alongside hours, has the sensual aura of the most feminine attire. The design is available in seven distinct versions, naturally attracting women in love with timeless glamour. Far from following trends, a watch must dare to take an original shape, a chic design. The Tissot Lovely Square represents a bold step forwards, while remaining a beautiful illustration of the influence of the past. With its delicate case, it falls perfectly into line with the trend of small watches worn like jewellery. It also demonstrates great creativity, thanks to a square design that suggests audacity where no one could have imagined: worn with a suit, perhaps, or an evening dress. Its various dials – light, dark and pastel – ideally match Milanese mesh or satin straps in lustrous colours, and enhance moments of great simplicity as much as those of great sophistication. To wear it is to fulfil one's desire for originality as much as to remain faithful to a certain classic elegance. With its suggestions of romance and rock-and-roll, the Tissot Lovely Square is designed for the woman in search of new adventures, experiences and encounters. Her heart’s desire? To be surprised.